Revitalise your Ski Wear Before Your Ski Holiday in Morzine! As autumn is nearly upon us, it means winter is not much further away. So guess it’s nearly time to dig out the winter woollies and look into booking a ski holiday. Once your ski or snowboard trip is planned and excitement starts to build towards, it’s time to get your kit out, as much to aid the excitement, as for checking it over (yes I too have jumped around on the bed with my board on). You pull out your jacket and pants and remember last year not being as dry and warm as you would have hoped and the thought crosses your mind, is it to get some new ones. Well before you rush out and part with your cash there are some ways to revitalise your old ski gear. There is a common belief that you shouldn’t wash your waterproof garments (especially amongst seasonnaires), but done properly cleaning your outerwear will not only keep it looking clean, but also help maintain the waterproofness. To understand what you need to do requires a little understanding of how your bit of kit has been waterproofed. There are 2 major ways of making waterproof clothing; using a coated fabric or a layered membrane. A coated fabric, literally has a waterproof layer coated to the inside of the outer fabric, where as a membrane is a separate layer bonded to the inside of the outer fabric. They function differently and have major differences in performance (that’s for another post), but either way it is this inside layer that makes the garment waterproof. Supplementary to that your outerwear will have a DWR (durable water resistant) coating on the outside of the fabric. This coating does not make your jacket waterproof in it’s own right (nor is it that durable) but does repel moisture on the outer surface (protecting the outer fabric) and aids the performance of your water resistant layer or membrane. 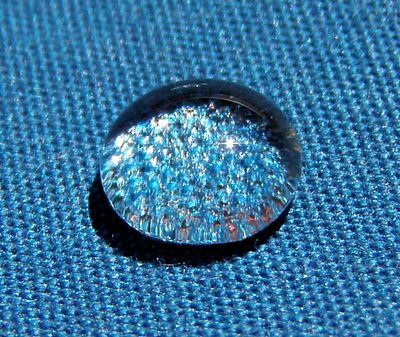 If you have ever gone out in the rain in a new jacket and found water beading and running off effectively, that is your DWR coating working effectively and has no bearing on the actual waterproofness of your clothing. What it does do is reduce condensation, aids breathability and keeps moisture from being absorbed by the outer fabric. However as it is applied to the outer face of the fabric it is easily effected by dirt and other contaminants (sun cream, vin chaud etc. 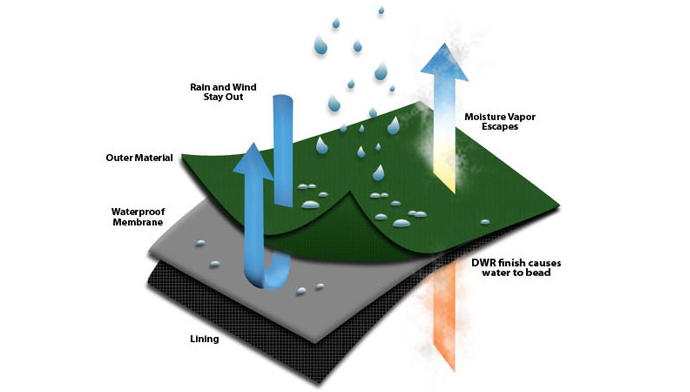 ), which allow moisture to penetrate the layer and leads to the outer layer becoming wet. Although you may still be dry underneath because of the waterproof layer, you will feel the moisture as a cold and clammy patch against the skin as well as your clothing becoming heavy and waterlogged. Periodic cleaning will help maintain the effectiveness of your DWR. As a guideline after every 20-30 days of use, if you can see a build up of dirt or are experiencing wetting out (the cold feeling). All garments should have washing instructions on the label, but as a general rule try to use free rinsing or non detergent products (avoiding detergents surfactants, softeners or whiteners). You can get specialist cleaning agents (from your local outdoor store) or if you only have normal soaps do a second rinse to remove any residual chemicals. If this isn’t as effective as you would like or you think your garment needs a boost you can buy products to reapply the DWR coating (again available at your local outdoor shop). These generally involve spraying the garment whilst still wet after washing, before putting it gently through the tumble dryer. Spray on repellents better compliment the original DWR and wont effect the waterproof layer like wash in products can. 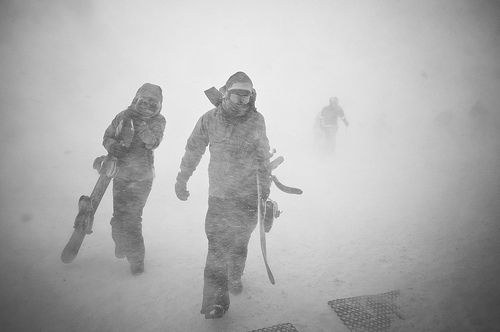 So next time you’re worried about facing the bad weather put on a clean jacket and go out with smile on your face. Remember if you are interested in booking your winter or summer holiday with Mountain Mavericks in Morzine we have lots of options to suite everyone, from baby friendly weeks to snowboard camps, we have it all covered! Just get in touch! Previous: Morzine and Portes du Soleil Announce Lift Pass Prices! Next: Christmas is magical in Morzine!